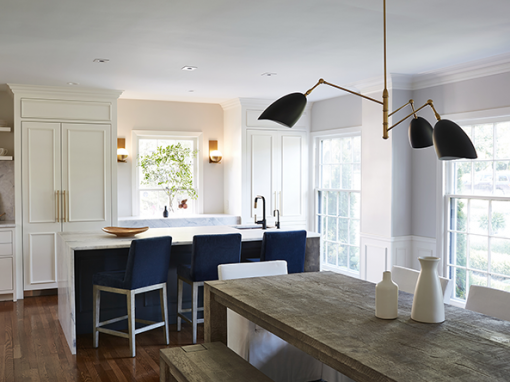 2015 Kitchen & Family Room | RB Schwarz, Inc.
My client owns a 1922 Dutch Colonial home in Shaker Heights, Ohio. The rear of the house had two previous additions, (not handled by R.B. Schwarz, Inc). 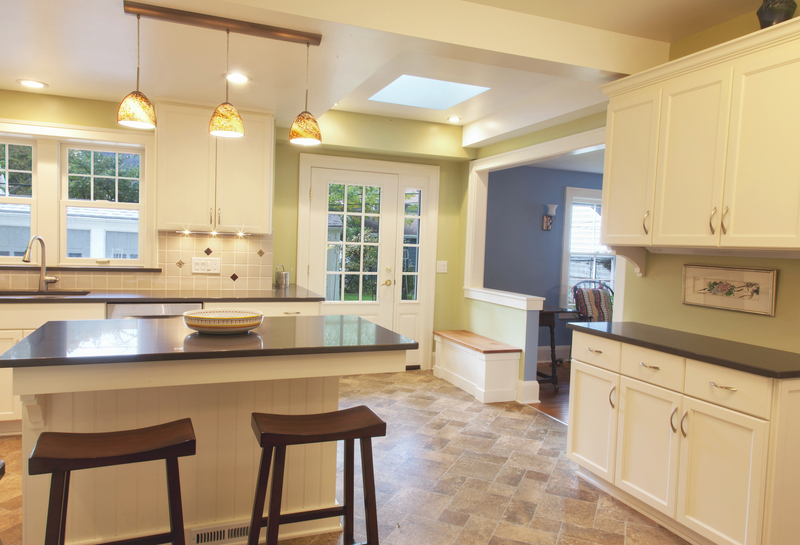 The first addition was a small breakfast room which created a cramped, L-shaped kitchen. The second addition was a family room. 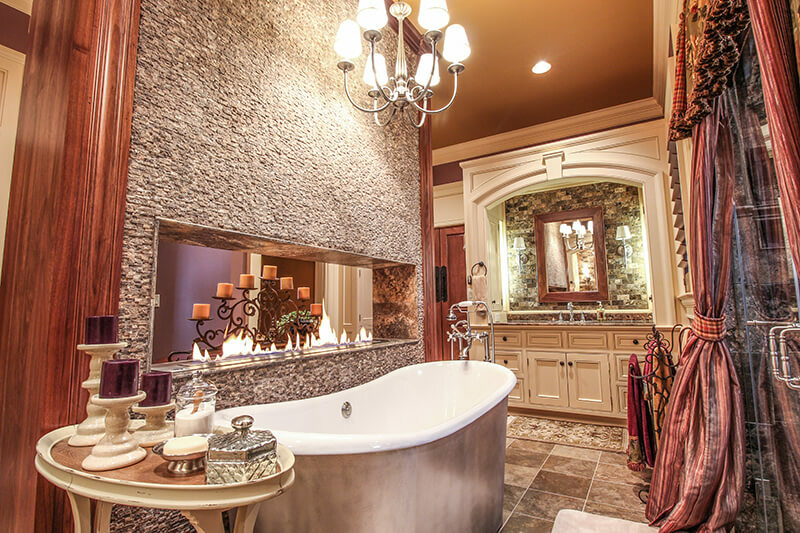 However, you could not enter the kitchen from the family room. 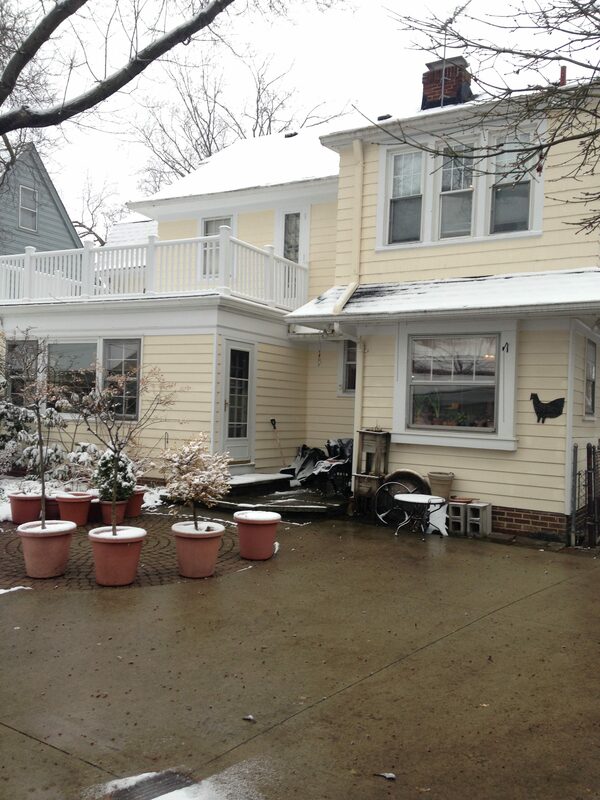 The previous additions did not match the architectural style of the original house. My client wanted a large, open kitchen with room for an island and access to the backyard from the kitchen. They wanted to be able to walk from the family room directly into the kitchen, and to make that walk without stepping up or down a level. Besides the kitchen and family room remodel, the home did not have central air. 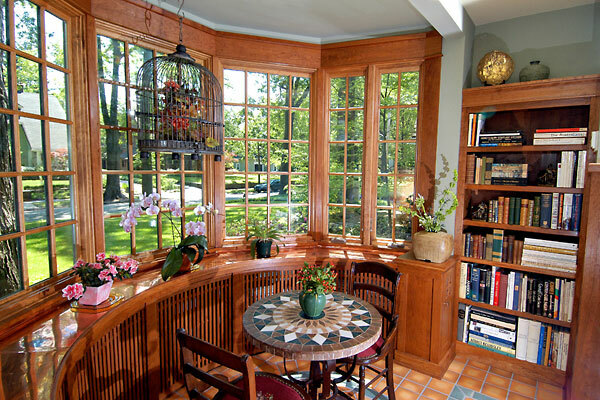 As a result, window units were used in the kitchen and family room. We wanted to eliminate these units. Keeping to a tight budget was a factor for my client. We had to deliver a top quality kitchen but not break the bank. 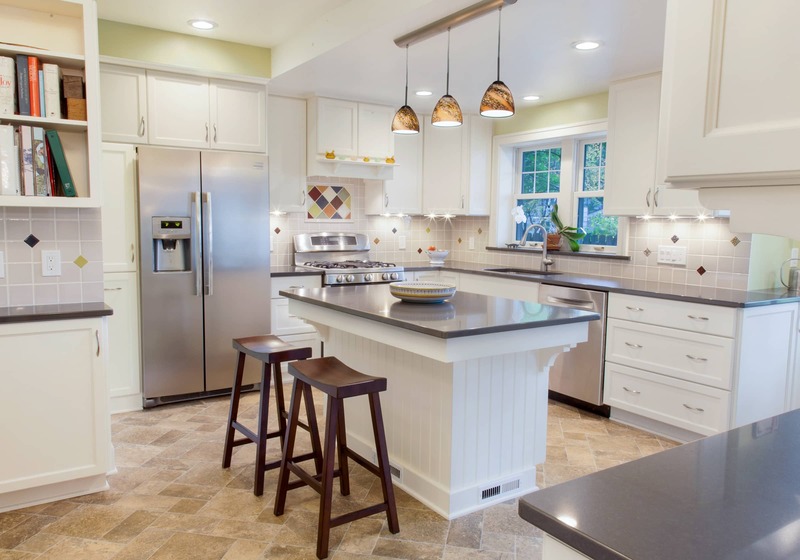 To meet my client’s needs, we built a small addition to connect the two previous additions, creating an open floor plan that allowed us to expand the kitchen and add an island. We created a new back entry to the home. The floor was raised in the family room to the height of the new kitchen floor. A sky light was added for more natural light. We also added more storage cabinets and counter top space in the kitchen. 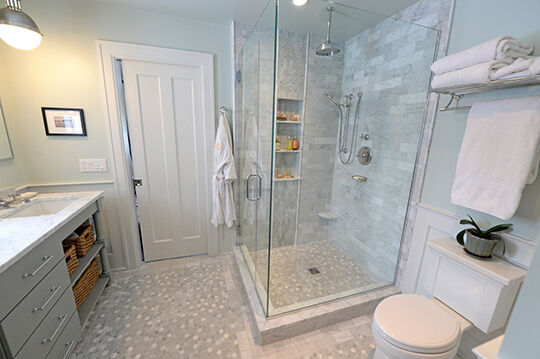 In this remodel and addition, we faced many challenges as one can expect with older homes. The rooflines on the adjacent additions were at different levels and the walls were not square. 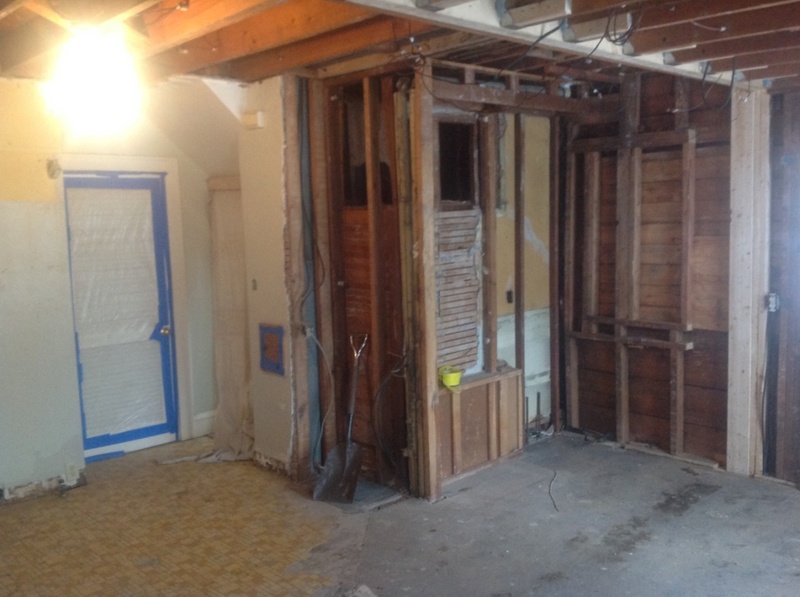 We also had to remove two load-bearing walls. Excavation was difficult due to a tight working area, and the electrical service was running through the area that was to be excavated. The original home had steam heat with no air conditioning. 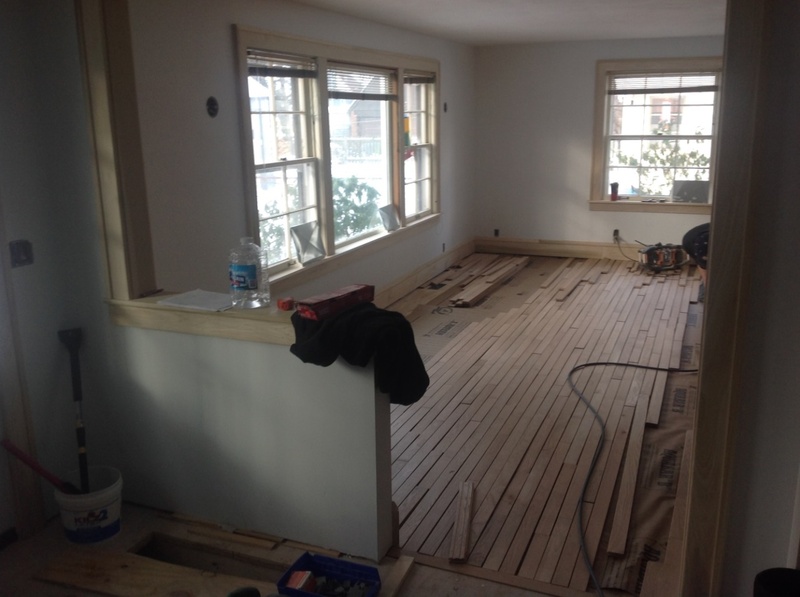 We eliminated the steam heat in the kitchen and family room and added a modern HVAC system. From this original image, you can pick out two separate additions. 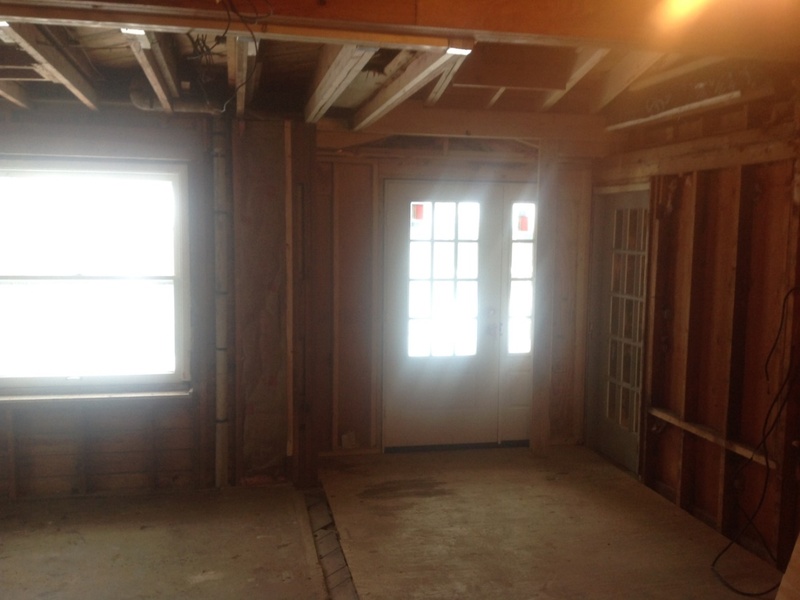 The bump-out on the right was a kitchen/breakfast nook addition, and the bump out on the left is the family room. The door on the left addition opens into the family room, but there was no door from the kitchen out onto the patio. 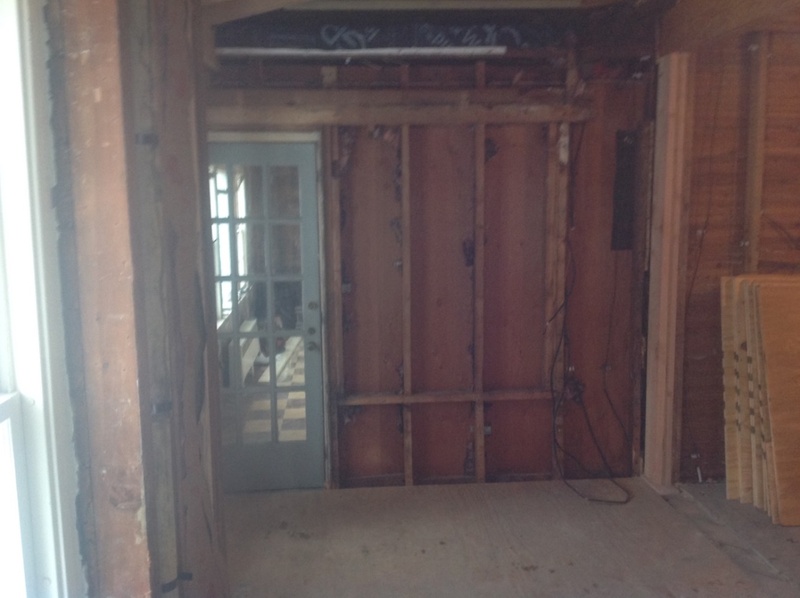 This image highlights the two exterior walls that will be removed once we have installed load-bearing beams. We’ll point out the center square is where the old sink window was. This area will become the back entrance. R.B. Schwarz, Inc. team will expertly rebuild ceilings, floors, crawl space and walls to turn a patchwork house into a cohesive floor plan. In this photo of the back entry, you can see the family room and kitchen are directly connected. The windows to the right of the door are new. The windows on the left were original with the first family room addition. We took great pains to restore as much of the original detail as possible. The original sink run was part of an old addition. 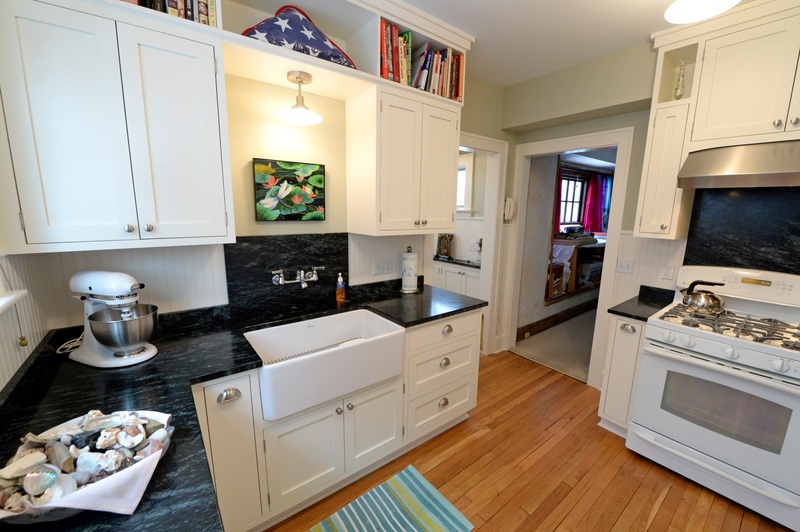 Note the 80s wall cabinets, limited countertops, small sink and large soffits. 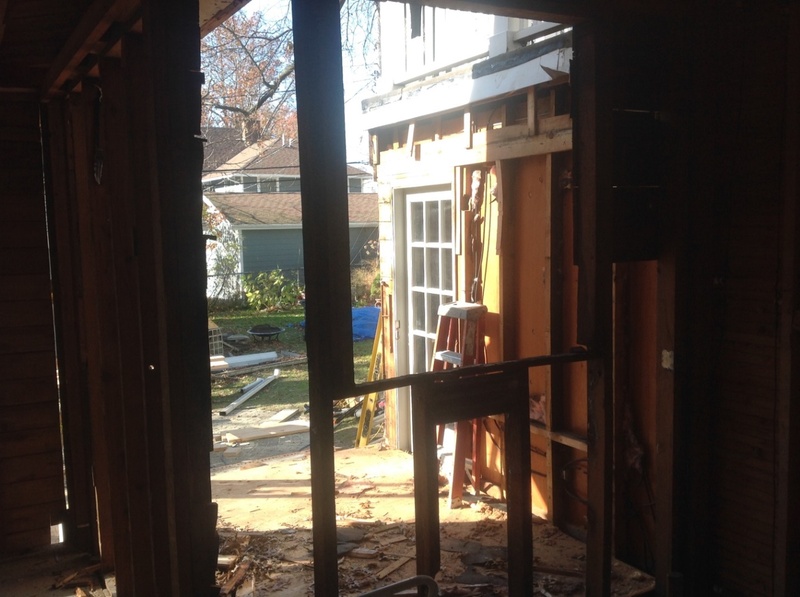 From the window you can see the exterior door that led into the family room. The bottom photo shows the sink run after we have removed the cabinets and plaster from the walls. The door in the background is the exterior door to the family room. This photo shows the finished sink run. 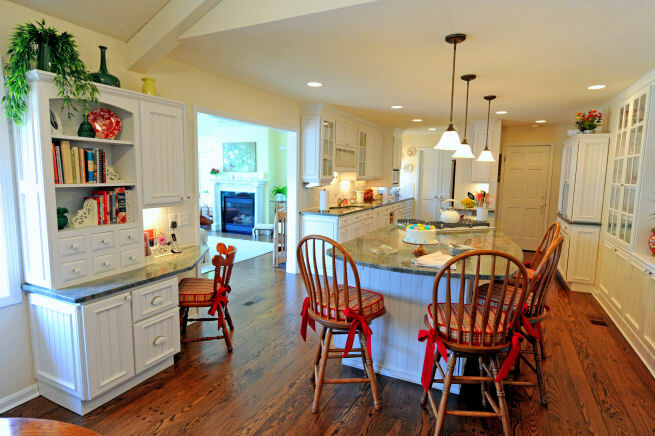 Besides more floor space and counter space, you can now see (and walk!) directly into the family room and easily exit to the backyard from the new Marvin door. 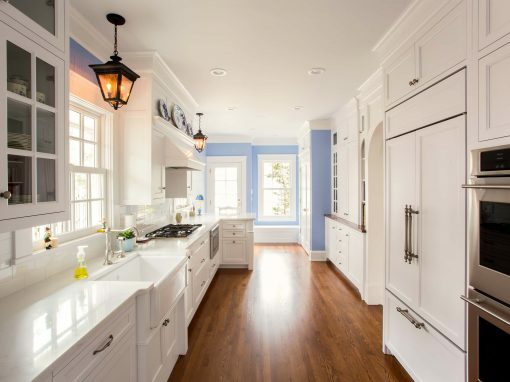 This bright new kitchen features quartz countertops and custom cabinetry. The old cabinets and counter in this breakfast room continued from the kitchen. But the layout was awkward and the space was cramped. 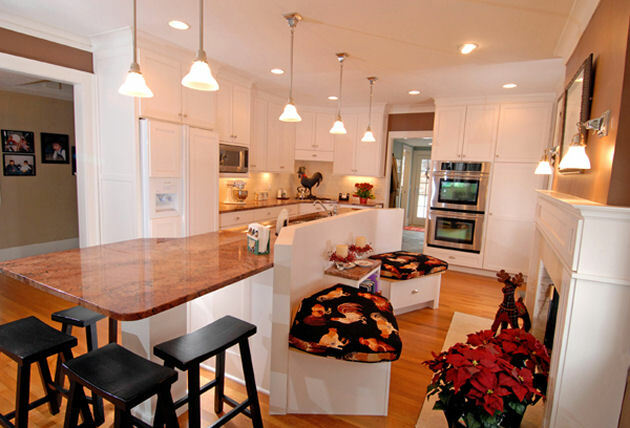 This photo shows the view of the completed kitchen and open floor plan. Homeowners enjoy light from the sky light in the ceiling over the new back entry. R.B. Schwarz, Inc. added wall and base cabinets on the right side are intended to look like a built-in hutch. 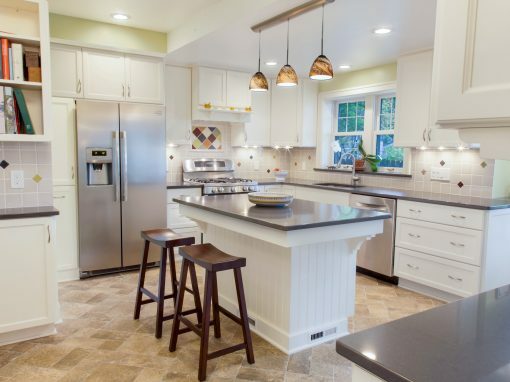 The back and sides of the island feature a beautiful beadboard. And the diagonal tile pattern is intended to mimic patio pavers. In a previous image, you saw the “before” image of cabinetry in the breakfast room; this “before” image shows another corner of the old breakfast room. 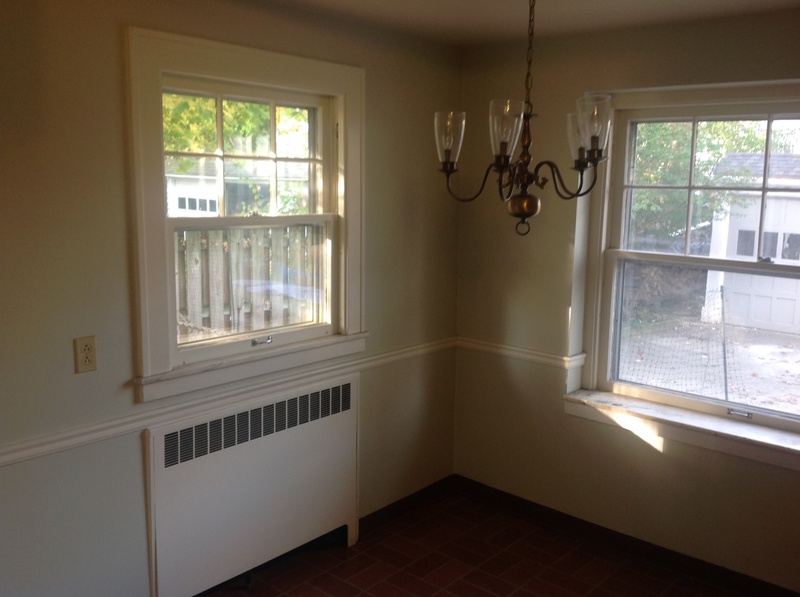 The window on the left and the radiator will be eliminated to make room for the new hood and stove. The window on the back wall will be replaced and relocated above the sink. 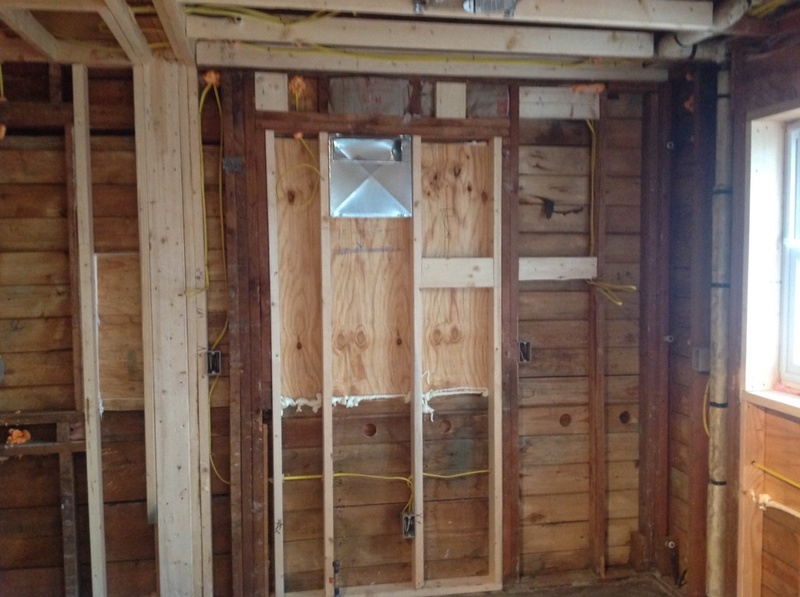 Image shows an exterior wall before insulation was installed where the stove will be relocated. The shiny metal object is the ducting for the new hood. The plywood patch is where we removed a window. 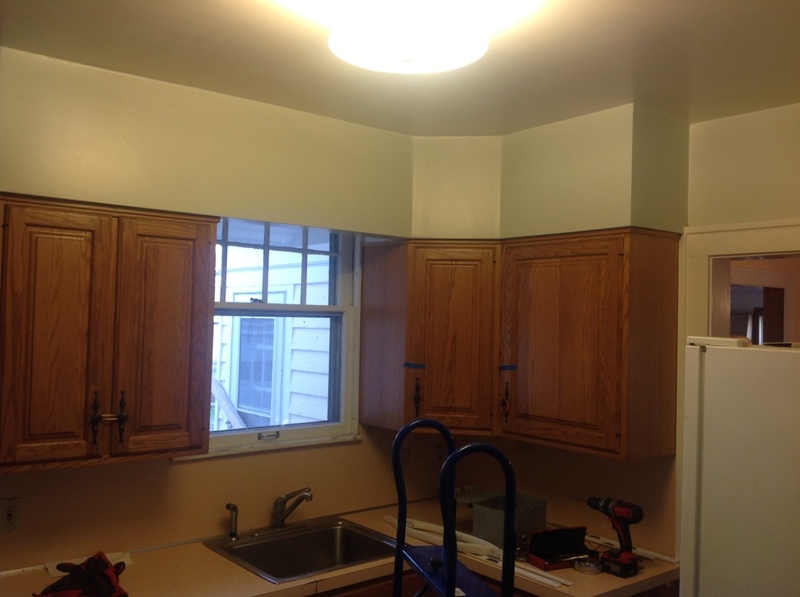 Transformation of this corner: With a window removed, the stove and hood are now located where the window was. The new island has ample space where guests can sit. The kitchen lighting has been greatly improved with a combination of 6” can lights, pendant lighting and surface fixtures! R.B. Schwarz, Inc. also added under cabinet lighting. 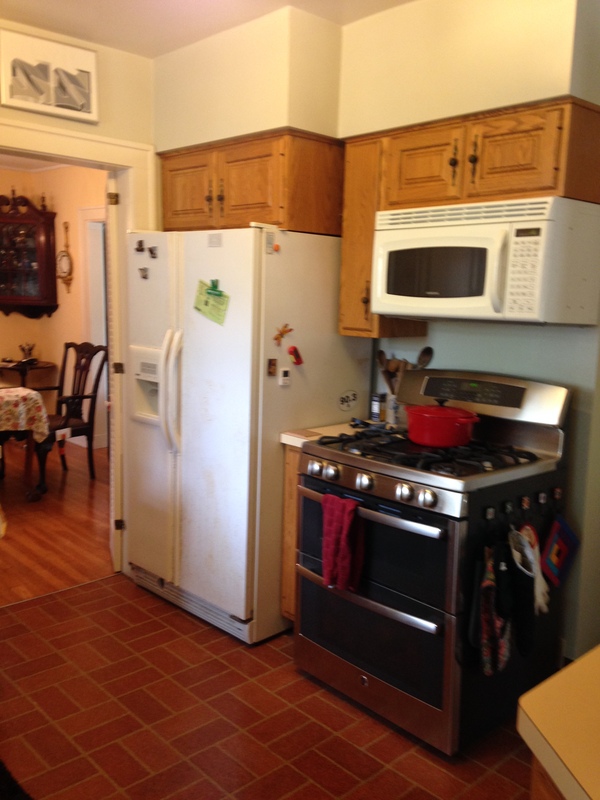 This “before” image shows the original refrigerator and stove located in the back corner of the kitchen. (This area is now a large pantry.) 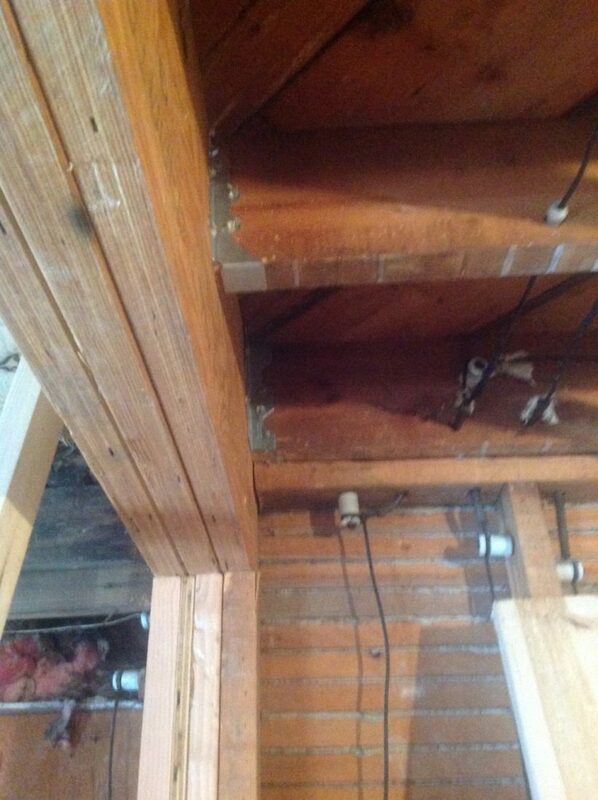 The large soffits were removed so that R.B. Schwarz could run the cabinets to the ceiling, as would have been the case when the house was originally built in the early 1920s. This “before” photo shows a small work area as you entered the kitchen. The around-the-corner design made the countertops hard to use. The door on the left in the background leads to the living room, so it will stay. The door on the right leads into a small closet that sat behind the cabinets. 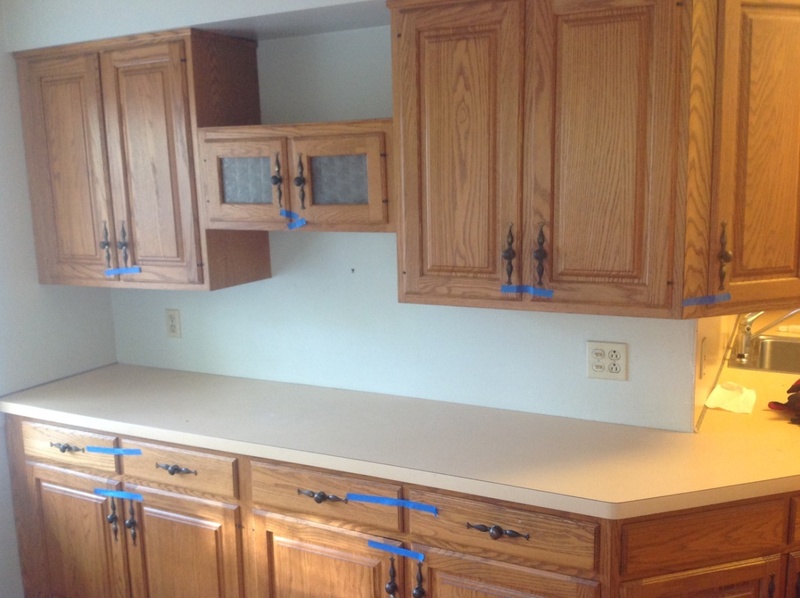 We removed these cabinets and closet which gave room for an island, more floor space, and the new refrigerator and cabinets to sit along the outside wall. The door on the left, which leads to the center hall and the living room, helps you understand what this space was and what it will be in future pictures! It’s the same corner after the cabinets and closet have been removed. We had to relocate the steam lines in this area and add new plumbing for the sink and fridge. The tight corner that was filled with two large appliances now is a huge pantry. Refrigerator has been relocated closer to the sink and stove. R.B. Schwarz, Inc. added built-in cabinets around the refrigerator to utilize what would be dead space. The tall pantry cabinets on the left are 24” deep and feature pull-out shelves. The upper section of the pantry cabinets have glass door and are illuminated with LED rope lighting. In the family room, we raised the level of the floor and installed new white oak flooring. We removed cheap paneling from the walls and installed insulation and 5/8” drywall. We adding new casings, back band and baseboard. R.B. 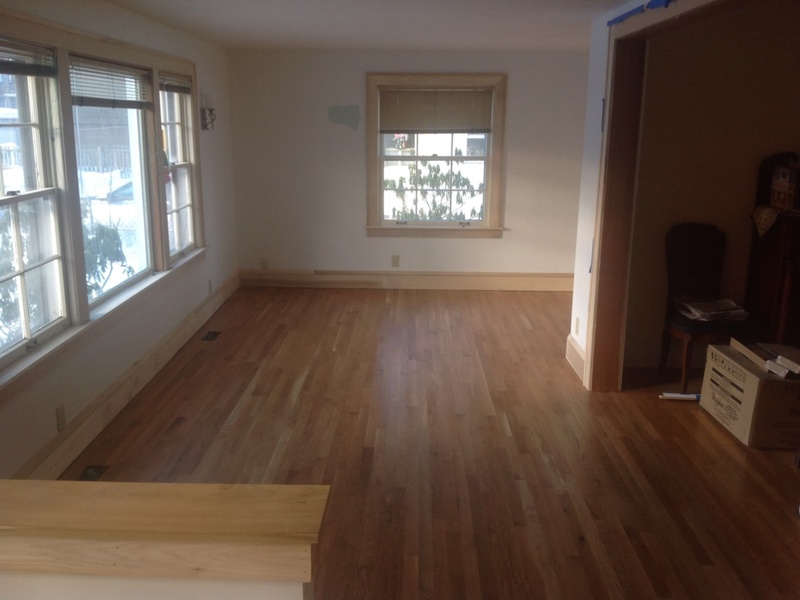 Schwarz, Inc. installed, sanded and finished new white oak flooring in the family room. Standing in the family room looking into the kitchen, you can see the dining room, family room and kitchen floors are now on the same plane. R.B. Schwarz, Inc. took down a wall and expande the doorway to give an open view. 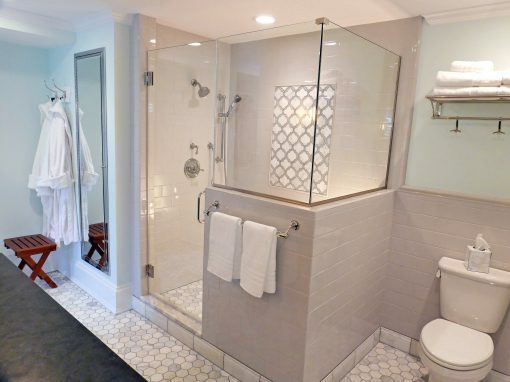 We used wide casing with back band and 3-piece baseboards to maintain the original character of the 1922 house. There were many challenges to connecting the two additions. R.B. Schwarz, Inc. had to remove two exterior walls that formed an inside corner. Both walls were load-bearing. 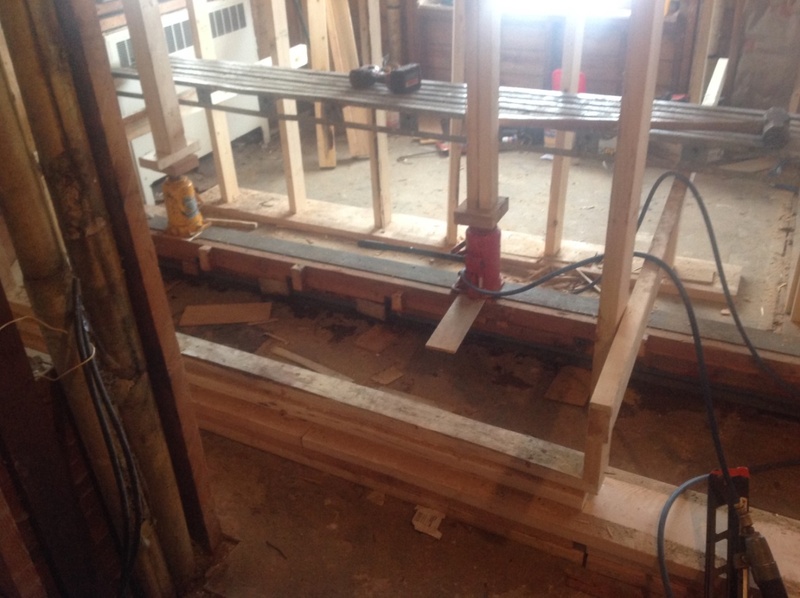 The top photo shows some of the jacks and temporary wall we built so we could add the new beams. What am I looking at? It’s a close-up of one of the two beams we had to install to support the second floor when the load-bearing walls cam down. This beam runs 16 feet across the entire kitchen. Besides having to move load bearing walls and adding beams, we also had to solve the different ceiling and floor heights. Nothing in the old additions were plumb and square. It took of hours work to straighten the foundation, floor and ceiling. What a beautiful kitchen! 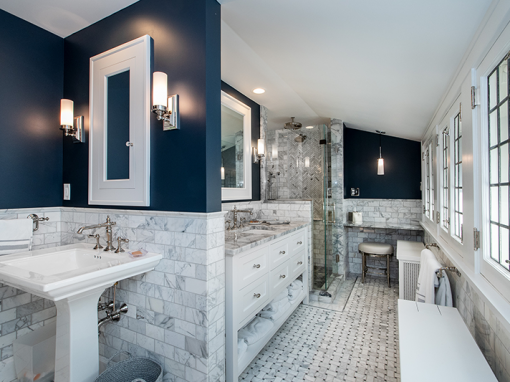 The tile backsplash was designed by my client and is a feature that was very important to her. The colorful mosaic above the stove is eye-catching and also my client’s design. She loves seeing her designs implemented in her new kitchen. R.B. 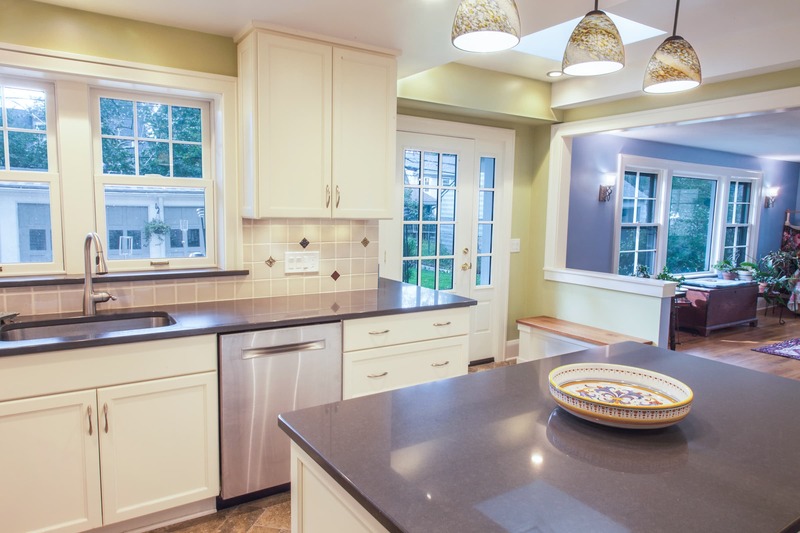 Schwarz is proud to give clients Cleveland’s historic homes beautiful and modern kitchen remodeling. The upper cabinets run to the ceiling. 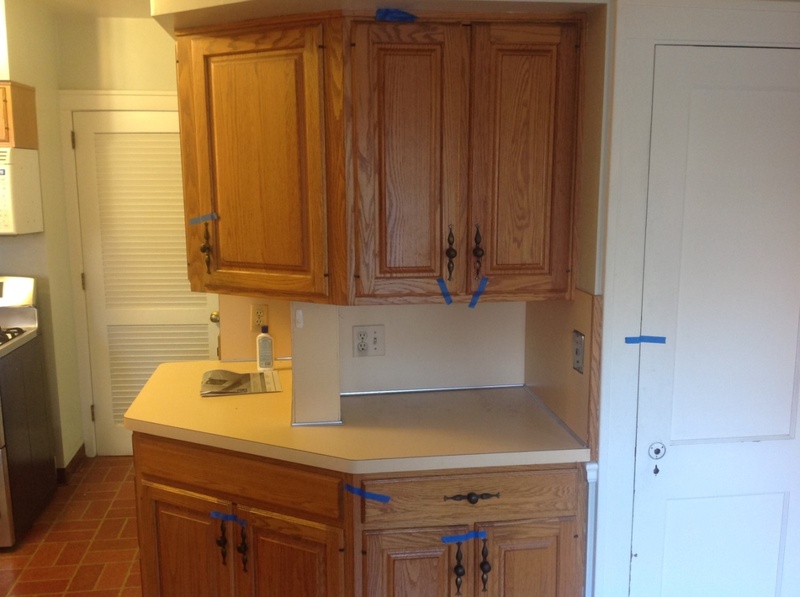 The Shaker-style cabinet feature an extra bead on the overlay. 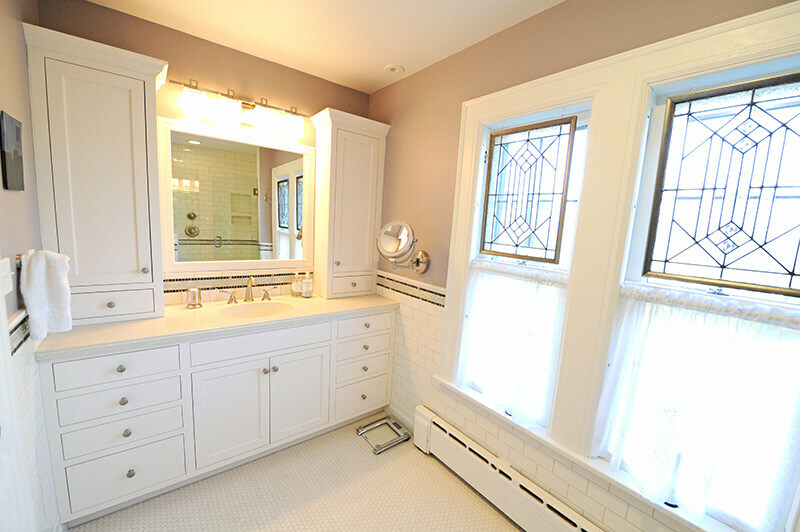 The custom cabinets include many modern conveniences, including soft close drawers and doors. R.B. Schwarz installed many pull-outs. 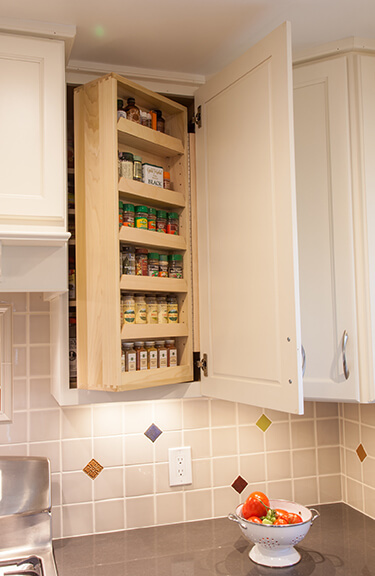 This cabinet features a swing-out spice rack which the homeowner loves. 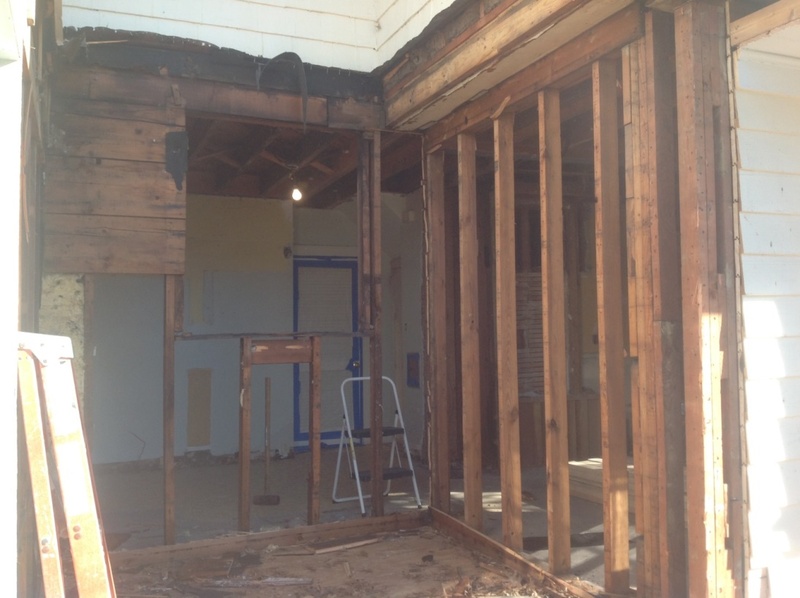 This photo shows the two walls removed. R.B. Schwarz has installed the new door, foundation and subfloor. The new addition connecting the two previous additions is only about 64 square feet; but it has made a tremendous difference in the floor plan of the house! The homeowner loves having a back door from her kitchen to her back patio. In our design, we included a simple custom bench for changing shoes. The new back entry is a fantastic improvement in both the appearance and function of the home. We asked R.B. Schwarz, Inc. to a fill the gap between two earlier additions on our 1922 Dutch Colonial frame house in Shaker Heights, Ohio. Robert and our architect designed an appealing plan that bridged the areas, and created an open plan that created a back entryway, opened up kitchen, and raised the family room floor to the level of the kitchen. The new floor plan created a comfortable flow from the kitchen to the living, dining, and family rooms. 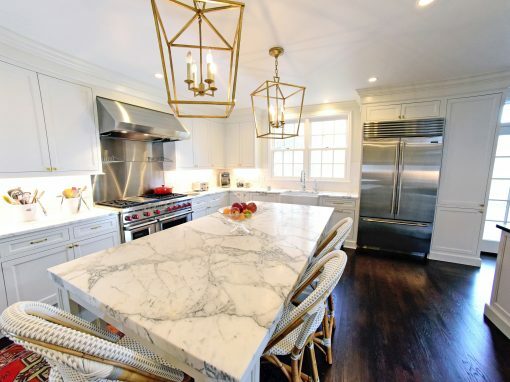 The result is a completely new kitchen space, and refurbished family room that completely redefines the house and makes it much more inviting and comfortable. Since we like to cook and entertain, it was very important to us that the kitchen should be not only attractive, but also an efficient “cook’s kitchen.” The resulting kitchen has a center island, Amish cabinets, and lots of light from a new skylight that brightens up the entry. 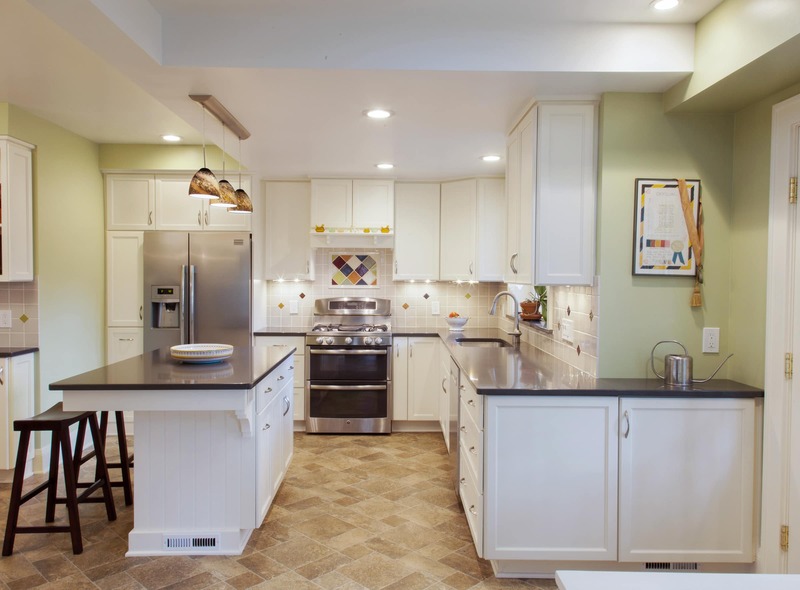 The painted cabinets have pull out shelves and soft closed fixtures, and a tile back splash is colorful and creative. It was a very complex job that involved significant structural, mechanical, and design issues that had to be overcome (for example, not knowing what supporting structures were in the previous additions) as well as aligning the two additions, which were not completely square. We also had a limited budget so we wanted to be careful about cost control. 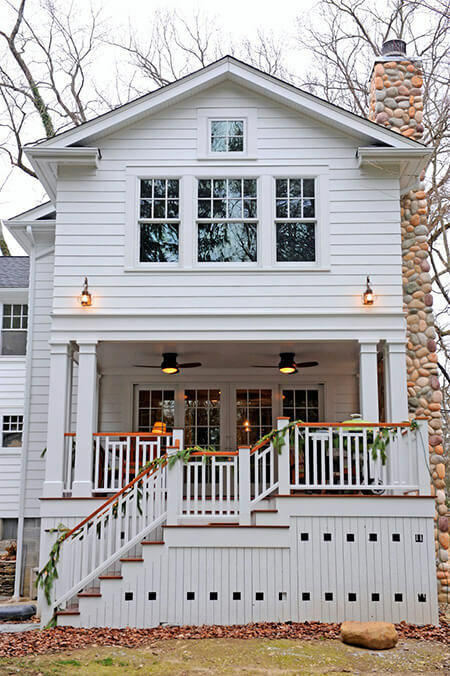 Robert and our architect were able to work together to develop a beautiful plan that transformed our home but was affordable. Robert and his crew were efficient and responsive. Robert was able to coordinate the various aspects of the job with skill and expertise. All of his crew members were very considerate of the fact that we needed to be able to live there even though the back of the house was removed! He was very good at presenting options and helping in the decision making. He was careful to inform us how any changes would affect the project budget. Robert takes pride in his work, and overall quality and client satisfaction are important to him. Months later we are still thrilled with the result and enjoy showing it off to our visitors.